Continuing its collaboration with the street art star, the avant-garde Swiss watchmaker launches two new models in its Formula 1 and Carrera collections at the TAG Heuer London Flagship Boutique. The story behind the new Carrera?s design is captured in a clever 60-second video. 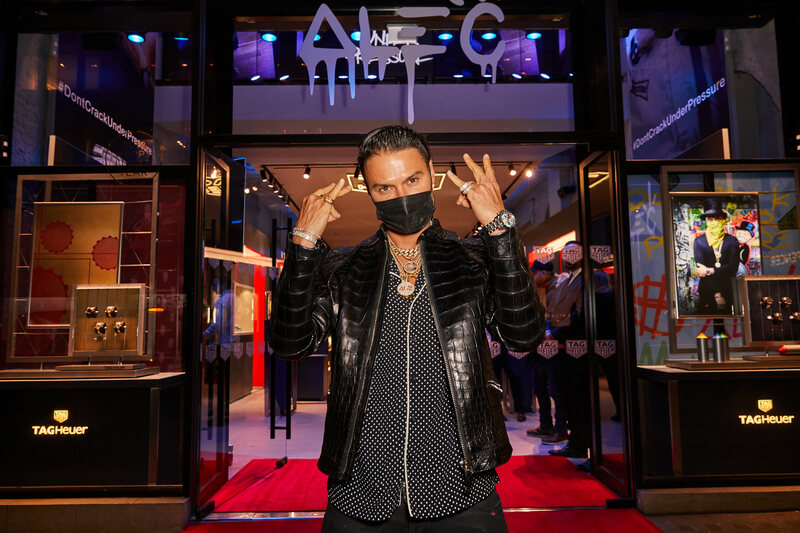 TAG Heuer?s Art Provocateur, Alec Monopoly, is at it again! The world-famous street artist has helped the Swiss watchmaker design two new models thatwere presented last night at a cocktail party at the TAG Heuer Boutique, in the heart of London?s West End. The gallery walls were adorned with original TAG Heuer inspired paintings and sculptures created by Monopoly. Guests witnessed Monopoly create a live painting customization across 50 of the watch boxes which clients had the opportunity to purchase that night. The Swiss watchmaker also presented a short video that tells the imaginative story behind the design on the dial of the new Carrera HEUER 01, one of the wristwatches unveiled at the event. Original and colourful, these TAG Heuer Formula 1 and Carrera wristwatches feature the little banker called Monopi wearing a red bandana over his face and throwing green cash across the dial. AlecMonopoly?s instantly recognisable signature is found in the background in yellow, blue and red. The 41 mm Formula 1 model is presented on a black rubber strap. The sporty watch features a stainless- steel unidirectional bezel with a black PVD coating that is engraved with a 60-minute scale. The watch?s bold black design is the perfect backdrop for the bright artwork on the dial to truly stand out. The Carrera model takes the idea a step further ? the eye-catching ALEC logo adorns the sapphire case back, through which the wearer can enjoy a view of the TAG Heuer Calibre Heuer 01 manufacture movement inside the watch. This stylish 43 mm chronograph features a case and lugs in brushed stainless steel and is presented on an H-shaped stainless-steel bracelet with an alternating brushed and polished finish. The fixed bezel, with its iconic tachymeter scale, is made from black ceramic. A new 60-second video conceptualised and created by TAG Heuer tells the story behind the Carrera HEUER 01 timepiece. One mysterious night at the Swiss watchmaker?s headquarters, a mural in Alec Monopoly?s studio magically came alive and the artist?s iconic character, Monopi, jumped out of the artwork. His overnight adventure took him through the offices, the TAG Heuer museum, lab and factory. In the morning when TAG Heuer?s employees began to arrive, the curious character had to find a hiding spot. Drawn to the timepiece on a watchmaker?s workbench, Monopi quickly dove onto the dial just before he was caught. The video has been published on YouTube and is also visible on all of TAG Heuer?s social media channels. Whether you believe in magic or not, the video is proof that there is a powerful creative energy pulsing through the halls of TAG Heuer.